You know who we haven’t talked about in a while? Donald Trump. Trump last appeared in a FiveThirtyEight headline on Oct. 2! That cannot stand. So for this week’s 2016 election Slack chat, we’re talking Trump. As always, the transcript below has been lightly edited. micah (Micah Cohen, politics editor): So what’s going on with Donald Trump? He fell in national polls after the second Republican debate, but that fall was brief and small, and he’s still in the high 20s. He has now led in the polls since the first week of July, and we’ve had several rounds of “this is the end of Trump” stories that proved off. We’ve been pretty skeptical of Trump’s chances to win the Republican nomination, but has his durability changed in your view? hjenten (Harry Enten, senior politics writer): Trump is ahead and was ahead. He has never trailed nationally outside of that IBD/TIPP poll. But here’s an important thing to keep in mind about Trump: We’ve been skeptical of Trump because even as he has led, he still hasn’t shown the ability to cobble together enough GOP voters to win after candidates start dropping out. In two of the three national polls out in the last week, it’s Ben Carson, not Trump, who led in first and second choice combined. natesilver (Nate Silver, editor in chief): So, my theory of the case is still contained in the “Six Stages Of Doom” article I wrote about Trump in August. That suggests that it’s still very early. Trump has perhaps survived Stage 1, “Free-for-all.” It seems clear that his success in the polls is not ​purely a result of media coverage — although media coverage plays a very important part of it, as we can discuss later on. But we haven’t really entered Stage 2 yet, which is “heightened scrutiny.” That’s when voters start to pay more attention to the race and polls start to measure likely voters instead of all Republican-ish adults. It’s interesting that Trump’s numbers were rattled a bit after each of the first two debates, for instance, since that’s a time when the candidates were on a more level playing field. tl;dr: Sure, his chances look a little better than they did a month or so ago. But I’m not sure anything all that fundamental has changed, and the fundamentals would imply his odds of winning the nomination are still pretty darn low. micah: Let’s try to get a more exact sense of where we see things. What were Trump’s chances of winning the nomination on Sept. 1? And what do you think they are now? hjenten: 2 percent and 4 percent. micah: TRUMP DOUBLES CHANCES OF WINNING! natesilver: Trump’s chances of winning the nomination are exactly 7.1459814514128405 percent. Just kidding. I’m somewhere in the high single digits. micah: And on Sept. 1? natesilver: Well, I put his chances at 2 percent in that “stages of doom” article, which lays out a procedure for how you’d calculate them. If he has cleared Stage 1, his chances would double, to 4 percent. natesilver: But I’d round up a little bit higher than that because I think he’s made some progress on some of the later stages. For instance, his favorability ratings — although still potentially a liability down the road — have improved some. hjenten: I think that “high single digits” is awfully high. Mitt Romney had a better shot of winning on Election Day 2012 than Trump now. natesilver: But there’s a lot of existential uncertainty here. If you’re being purely empirical — well, nobody quite like Trump has won a party nomination before, or even come all that close to it. So there’s some universe where his chances are 0 percent. hjenten: Most of the uncertainty for me is not whether Trump loses, but when he loses. natesilver: I agree. And look, to some extent 4 percent vs 7 percent is an angels-dancing-on-pinheads debate. natesilver: Some of what caused the big uptick in Trump’s favorability ratings in the spring and summer may have been that he went from someone who wasn’t identified with a party to someone who began calling himself a Republican. Interestingly, his overall​ favorability ratings (i.e. with Democrats plus Republicans plus independents) have been extremely steady throughout the campaign. Nonetheless, one of the lessons of Trump is that favorability ratings can be volatile too. hjenten: Yes, it can be very volatile. We’ve seen it move around. It probably spiked before the second debate. I think based on the data that he’s halted his post-second-debate slide, but he’s off his peak. natesilver: So, I think we might want to contemplate that very pattern, which is that Trump fell a bit in the polls after each of the first two debates before recovering some. That was clearer after the second debate than the first one, but probably true for the first one, too, if you look carefully enough. micah: And you see that as foreshadowing? Do the debates have anything in common with later stages of the primary? hjenten: I think they do, in so far as it’s the one time when more people are paying attention to politics. natesilver: But the voters who participate in Iowa, New Hampshire and other early primary states will have paid a LOT of attention by the time they vote. It’s not perfect, but you can look at a Google Trends chart of when interest in the 2012 primary campaign spiked, for example. It was about seven times higher in January, February and March than it was in October. micah: I’m not sure what point you’re making. natesilver: The point is that “campaign time” is not linear. We’re still in the functional equivalent of the top of the second inning. micah: But what do Trump’s post-debate dips suggest to you? natesilver: That possibly his numbers will suffer as he faces more scrutiny from voters. And as the media coverage evens out a bit. OTOH, the steady state where nothing much is happening in the campaign seems helpful to Trump, who is able to turn empty news cycles into Trumpian ones. hjenten: I should point out that it’s clear that Trump has suffered at least a little bit, even WITH the debates relatively far in the rearview mirror. For instance, it’s clear now that Trump has weaker support among women than men. It’s clear that better-educated Republican voters are less likely to support his campaign — stuff you might have expected after his earlier controversial comments. Back when he started leading in the polls, Trump’s numbers were strong across the board. They’re still good, but they’re not uniformly good. It’s as if he’s become more of a traditional candidate, and the rules of politics now apply to him. natesilver: Maybe. But I’m more on the side of saying that nothing much has changed in the campaign, so we shouldn’t necessarily expect dramatic changes in Trump’s numbers. For that matter, I don’t take for granted that he’s going to fall to zero, or into the single digits. Some Trump-like candidates have won 20 or 25 or 30 percent of the vote before, especially in Iowa and New Hampshire. hjenten: That’s why I look at the first and second choice numbers, to get an idea of the ceiling. micah: Is it safe to say we’ve seen Trump’s ceiling? hjenten: No. Not in my mind. natesilver: I don’t think there are any totally safe predictions about what Trump’s polling will look like in the near term. micah: And how much of Trump’s durability has to do with the other candidates? It’s a bit of a chicken-and-egg thing, but no one else is catching on it seems, right? 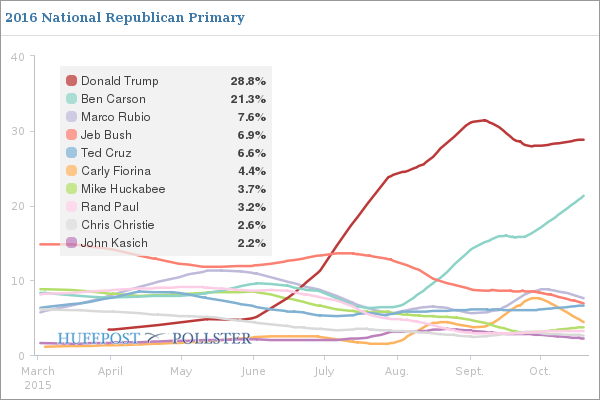 natesilver: Carly Fiorina’s rise and fall is interesting. She doesn’t seem to have a way to stay in the news cycle in between debates. micah: Right … Carson is basically co-leading with Trump, but everyone else has fallen into a pack in the high single digits at best. And even beyond the polls, no one seems to be getting much favorable buzz or much of anything. natesilver: Yeah. It’s not just that support is divided but that ​attention is divided, too. hjenten: Look at the Democratic side. Note how Hillary Clinton has gone up in the polls with positive press coverage. Notice how she has led now in two of the three post-debate polls in New Hampshire. Press coverage means a lot. When you get down to just one or two folks to concentrate on in addition to Trump, that should hurt him significantly. natesilver: Certainly, the Democratic polls over the past couple of weeks have made political scientists and “data journalists” look smart. But it’s possible that the Republican Party is a different beast. micah: It does kind of all go back to something we talked about early on in the summer: Even without Scott Walker and Ricky Perry, this is a historically huge GOP field, and that fact is underappreciated by the media. natesilver: It’s historically huge, and also the establishment hasn’t really settled on a candidate. hjenten: Of course, it’s possible that this is a different beast. We’ve had 12 open primaries (i.e. no incumbent president running for the nomination) since 1980. It’s a small sample size, but I don’t know how we can say the system is broken when there is no clear party-actor favorite. Perhaps that gives Trump a better shot, but it also may mean (and in my mind, probably does mean) that Trump is adios goodbye when they do settle on the anti-Trump. Trump for the record still has 0 endorsement points. micah: Right, part of me wonders if the Trump fade won’t come ​until​ the establishment rallies behind a candidate. natesilver: Even if “this time is different,” that doesn’t necessarily culminate in Trump’s nomination. He has a lot of other liabilities, such as still-just-lukewarm favorability ratings, the lack of a traditional campaign organization, and a bunch of policy positions that are at odds with those of Republican primary voters. hjenten: If the system is broken — or at least different — then it could benefit someone besides Trump. That’s part of the reason that I think Ted Cruz has a shot. natesilver: Yeah. I’m more of a Trump skeptic than a Party Decides truther. Maybe the Republican establishment is partly but not entirely broken, and that results in a messy nomination process, but Trump still doesn’t win. About the only thing the Republican establishment agrees upon is that it doesn’t want to nominate Trump. Trump hasn’t been knocked down yet. And when he has faced his opponents in debates, he has been taken down a peg or two. Let’s see what happens as the campaign continues and shots are fired on television beyond just the nightly cable news talk show stuff.